I love old doors of all kinds. 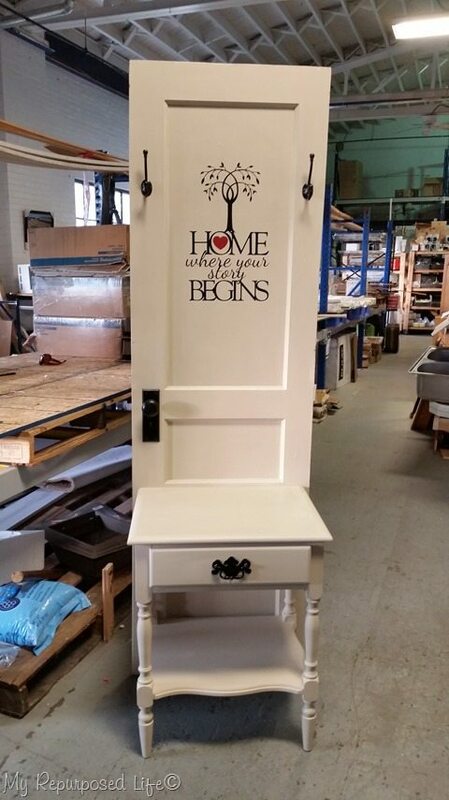 Repurposed doors are perfect for new and useful projects to add pizzazz to your home. They are easily found at thrift stores, yard sales, and my personal favorite—your local Habitat for Humanity ReStore. I have used them a lot in my projects, but I have also compiled some other projects from around the the web to inspire you. The hall tree that inspired me to make the blue hall tree above is this great two-toned hall tree by Refresh Restyle. This one matches the door in the first picture, I picked up two of these $2 doors, and to this day I’m wondering why I didn’t buy ALL of them. The blue hall tree was trimmed out with some 1×4’s to make it look like a paneled door. This project was dressed up with a dresser mirror. Some projects are easier than others. This simple black small entryway hall tree is from the archives, and even a beginner could make this. Easy hall tree project, simply attach a small side table to an antique one and paint to match. Even louvered ones can be used to make hall trees or shelving units. My friend Jan had hauled a this thing around through several moves, and asked me to use it to make her a similar nightstand of her own. Just to show you that color really can make or break a project, look how beautiful this hall tree from Junk Chic Cottage is all painted in white! Here’s a repurposed one as a coffee table from Joan, one of our contributors. This red bookcase is one of my earlier projects. Blue Roof Cabin did this awesome book shelf guest post on My Repurposed Life. I was inspired by Blue Roof Cabin to make this repurposed bookshelf, which is one of my most pinned projects. My very first door project was this large corner cabinet..
How to use them as an outdoor arbor. This old exterior one was made to make a fun and functional potting bench. Vintage door made into a porch swing from Huckleberry Lane. An old paneled one makes a great bench, in this case a small doll bench. Blue chair bench from Dumped and Discovered. Repurposed Vintage Storm used as a craft show display. 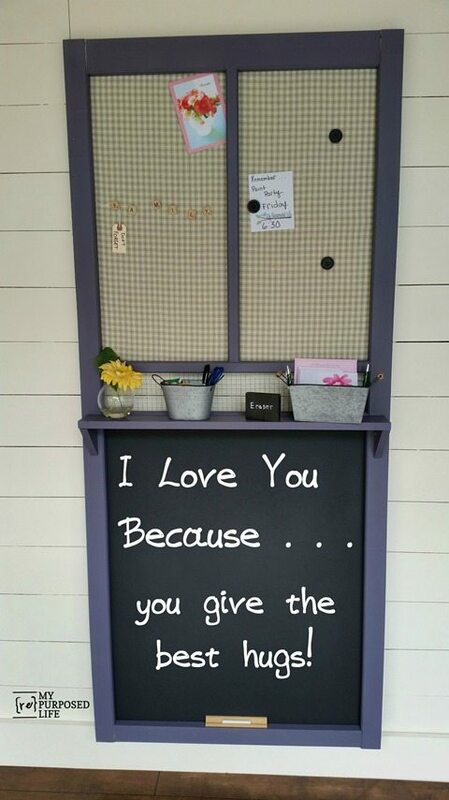 Another one made into a memo chalkboard. Cutting up heavy ones can be challenging, but oh so worth it because they make such trunks and chests. Here’s another repurposed chest. This blanket chest was made from a hollow core door. Doors make great headboards! I made this headboard for my bedroom out of the ugliest door ever. I made this repurposed door headboard for the queen sized bed in my guest room. Beautiful headboard made from a door by Vintage Revivals. When they are flat, they can be used as desks and tables, such as in this sawhorse desk. An old friend of mine, Sharon S. inspired me to make this Toddler Bed out of a very old chippy door. Using old random doors to make a screen or room divider from Thistlewood Farms. This roundup of old door projects will be updated as I find great new projects to inspire you. I would love for you to pin this image so others can find all of these great ideas. If YOU have a great repurposed door project that you would like for me to include in this roundup, please drop me a line or leave a link in a comment below. More collections to inspire you! I think the screen door projects would be great! I have a ton of old screen doors from people I’ve replaced screen doors for. I usually just throw them out. Maybe my crafty daughter can take up some of these projects. Thank you! It was an awesome project and fun to do! awesome job Roni! thanks for sharing it. I LUV old doors! And they make great project material! I love your projects Gail- AND your imagination. You’re definitely one of the best! Wow Gail! You covered it all! Thanks for the inspiration…as always! Great collection, Gail. I will refer to it when I finally do something with my stash of doors. For years I have wanted to make a headboard with an old door. Now I just have to find the right door. Thanks for all of the wonderful inspiration! Holy cow this is a fun collection! I want them all!